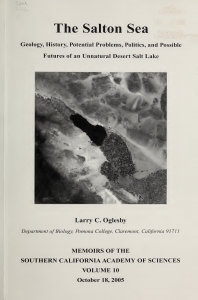 Note(s); There are extensive sources from the 1800s and 1900s, as early as William P. Blake’s 1854 accounting of the region, theorizing the idea that the northern part of the Gulf of California – Sea of Corez was cut off by the delta of the Colorado River. As a consequence there are a large number of books, publications, and web sites that continue to disseminate this inaccurate information. Even though it is a plausible concept, the original theories were made at a time where consideration of the tremendous amount of tectonic plate movement in the area was not accounted for.